In the articles before we provided you with some good advice about tree removal and trimming. Now it’s time to get you familiar with some special equipment. Without it, you won’t be able to complete safely any of the tree works in your garden. Before you start practicing all the techniques from our previous posts you need to make sure you supply yourself with the proper equipment for the job. Every tool should be in a good condition and it’s wise to test it before using it on a tree. The equipment we listed below is required if you decide to cut a mature tree on your property yourself. Chainsaw itself: Of course this is the most important piece of equipment you will need. The chainsaw should have a twenty-inch bar and around 3.5 horse power. The bar indicates the depth that the saw’s blade can penetrate. In most of the cases, twenty inch is enough. 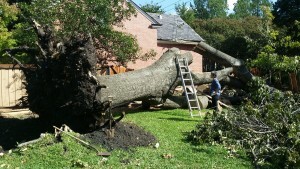 Contact Bradshaw Tree Services Sydney we will do the job for you!